Can't find what you are looking for? De La Coeur welcomes (and encourages) custom orders. Pick your style, colours and special extras, then leave the rest to us. Big ears? No problem! We can do complete custom fittings from minature horses to 18+ hand warmbloods. Ask about our innovative sound proof ears that help block wind and muffle sound- lose those itchy ear stuffs once and for all. Custom orders require 3-5 weeks for production, and 5-7 days for shipping. Rush orders are available by request for extra. CUSTOM ORDERING INFORMATION- Create a custom bonnet. Select your size, shape, colours, trim, bling and extras. SPARKLE THREAD - White, black, purple, pink, blue, silver, gold and green sparkle threads available. RHINESTONES - Available in single, double or triple rows in either a silver or gold setting. COLOURED CRYSTALS - Available in single, double or triple rows to match every colour yarn. 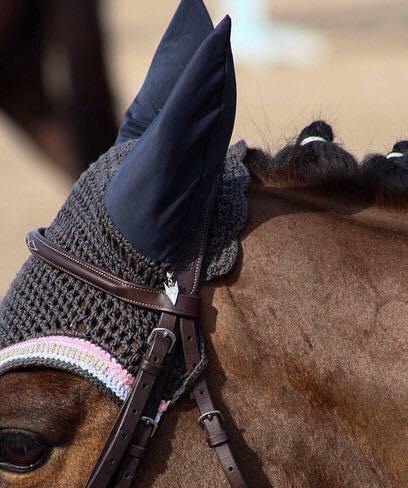 MONOGRAMMING - Embroider your name or horses name on the ear. We offer embroidery for your farm or company logo on the bonnet, perfect for sponsorship. Iron patches are also available for sports teams by request. Inquire for options. 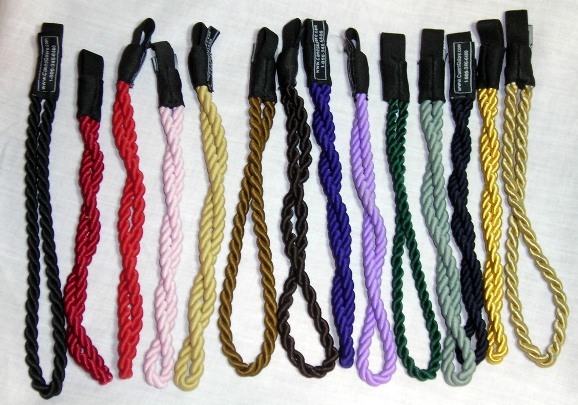 TWISTED CORD- Available in single or double rows. We have cord to match every colour yarn. Custom, glittery and metallic colours available. BONNET CHARMS - Charms are available for your bonnet in our silver DLC logo. Each charm is complementary with bonnet purchase. For additional pictures of bonnets we have created for clients, please visit our Facebook page here.